The Stratford Interfaith Centre is a community proud of its diversity and is committed to promoting equity and respect and upholding these values by showing respect to the space and people who share in it. With that in mind our facility will be available in early 2014 to be booked for programs and sessions promoting these values. Here at the Stratford Interfaith Centre we know in order to be integrated, balanced and healthy, we must find and deepen our connection to our bodies, our minds, our souls and our spirits. We must find ways to nurture each individual aspect of our being. At the Centre we offer several modalities that help us find and deepen these connections. The Stratford Interfaith Centre seeks to increase the understanding of and respect for religious and spiritual beliefs and practices across the world. Rev. 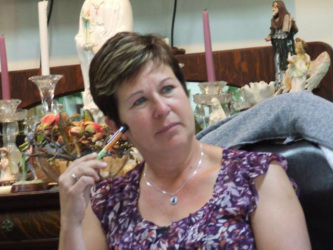 Debra Sinclair is an ordained minister with the Open International Ministry. She is committed to life-long spiritual growth, while also helping others bring clarity to their own spiritual growth. Rev. Deb is available by appointment for Spiritual Direction /Companioning; Bereavement Companioning; Reiki/Spiritual Healing; Meditation/Spiritual Healing; Funerals; Baby Blessings; and House Blessings. She is also available to facilitate several workshops including The Celestine, Prophecy; Effective Prayer; An Introduction to Chakras; An Introduction to Angels; Healing is a Journey; A Conversation with God and Meditation Groups. Rev. Deb is also available for those who would like to learn more about the healing qualities of Reiki by learning each of the three levels, either one to one or in a group. Reflexology is a focused pressure technique, usually directed at the feet or hands. It is based on the premise that there are zones and reflexes on different parts of the body which corresponds to and are related to all parts, glands and organs of the body. Reiki/Spiritual Healing is a gentle holistic practice that enhances life at all levels as it works to incorporate the mind, body and spirit. It can be used on every living thing. It is an energy used to help increase the natural flow and rebalance energy centers in the body. Jaci's journey of self-study, inner reflection and personal development has been a strong motivation for her desire to help others. Her gentle demeanor, intuitiveness and honoring with each of her clients has contributed to her high level of ethics and professionalism. She is available by appointment for both Reiki and Reflexology/Spiritual Healing Sessions. Reiki/Spiritual Healing is a Japanese holistic, light touch, energy based technique that brings balance and harmony to the mind, body and spirit, which are seen as one unit that must be harmonized for overall wellbeing and health while promoting Spiritual Health. Crystal/Spiritual Healing is a therapy that employs the application of crystals and gemstones to facilitate balance and healing. Sherry's passion for knowledge and wisdom, as well as her desire nad ability to share her knowledge and skills, are gifts she gently shares as an ethical and professional practitioner. She is available by appointment for both Reiki and Crystal/Spiritual Healing Sessions. Antoinette has followed the advice of self help books to "do what you love" and career counsellors to "find what you are good at." She loves dealing with clutter and she is good at it, all the while honouring and practicing non-judgment of each individual situation. Antoinette is kind, understanding, and respectful, and is ready to clear your clutter with accountability, laughter and love. She is available by appointment and is also available to facilitate Clutter Clearing Workshops and Gatherings based on her experience and knowledge in decluttering and creating Sacred Spaces. Life Witnessing is an opportunity to clear the clutter of the mind and the soul. Antoinette serves as a witness and mirror, who with her gentleness of soul helps you see the answers that rise from within your Self. She is available by appointment. Antoinette is also an exciting, empowering facilitator of Energy Workshops that serve as an invaluable class on Energy. She is available for small group workshops for those who are ready to experience the sacred energy surrounding us. Really - What Is This Interfaith? For several years now many of us have seen the emergence of a spirituality that encompasses people of different religions and cultures finding great value in the teachings of religions that are not part of their original culture. However, interest in other's religions is as ancient as the different religions. History records many examples of interfaith initiatives and dialogue throughout the ages. The first attempt to create global dialogue in faiths was in 1893. In the 1960's the Interfaith Movement gathered momentum. After 2001 there again has been a resurgence of dialogue between world religious leaders. Within the Interfaith Movement there are no labels. It does not need everyone to agree. 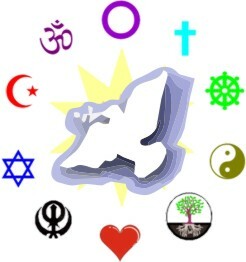 Interfaith recognizes that differences is what makes us religiously, spiritually and culturally diverse. It does not need to know what religion one follows. Interfaith sees only that each person has a connection with the Divine. Interfaith does not ask you to turn your back on your own religion or tradition. It simply suggests you open your mind to the possibility that God can be seen from many different angles. Often by exploring Interfaith dialogue and interactions, there is a reflection, questioning and investigation of one's own personal belief and tradition leading to a development of a deeper understanding of one's own religious, spiritual and cultural identity while awakening a desire to learn more about other's traditions both spiritually and culturally. Interfaith reflects a greater understanding that we are all climbing the same mountain, albeit on different paths, with the number of spiritual paths being exactly equal to the number of uniquely sacred people who walk them. Interfaith recognizes that one must search and find the path and the set of spiritual practices that suit one's life circumstances, history and personality. This not only will differ from person to person, but may even vary time to time in one's life. Interfaith believes there is a vested interest in getting to know and supporting each other, honoring no matter what our differences in daily hardships, cultural practices and religious views. Faith is a journey, a holy mystery in which we all take part. Let us work together to honor life as a whole, believing that love compassion and community are stronger than anything that makes us different. I bring the spirit of grace to all I do. When I am in a state of grace I am in tune with the Divine. When I let go and open the doors to my soul, grace arrives effortlessly. Grace is the touch of the Divine and in turn I whisper a grace as an expressions of gratitude. Grace is a promise of a new beginning guided by Divine Love. I make my life more grace-full by moving in gentleness, serenity and harmony, knowing I am worthy. I open my heart to the luminous Light of Grace. This is part one of a talk I presented at a Women’s Health Expo on Nov 2, 2013. I am a seeker. Since I was very young, I have been searching for spiritual answers. I have experienced the Protestant religion, Catholicism, the charismatic movement, New Age and currently I am studying Interfaith which includes Islam, Muslim, Buddhism to name a few. There are those who might call this “church jumping.” I see it as a spiritual life evolution - getting to know myself better and seeking Source of All and the different ways Source has created for me to connect with it. I have learned a lot of lessons in this life and I would like to share four of them that have greatly impacted my way of thinking. Lesson #1 - “We are spiritual beings having a human experience.” Many people question whether they are spiritual or not. Everyone has a spirit so that makes us all spiritual and whether or not we want to delve into this knowledge in a deeper way is an individual choice. Most often we concentrate so much on the physical and its’ needs that we forget that our spirit has needs also. I have noticed when my spirit is not being cared for, when I don’t make a conscious effort to connect with Source/God/Creator/the Divine, it very often manifests as an illness in my physical, mental or emotional self. Disconnection with our spirit can manifest as anxiety, depression and hopelessness. I connect with my Creator through prayer, meditation, spending time in nature and with children, laughing, playing, listening to music, singing, dancing and self-love. Loving yourself is tantamount to being healthy. When we love and respect ourselves, we take the necessary time to regenerate and rest. We refuse to pass judgment on ourselves or on our choices and reactions to daily experiences. When we love ourselves, we know we are okay where we are in life. When we love ourselves, we are willing to honestly look at ourselves to find better ways to live and co-exist with others, our world and our Creator. Lesson #2 – “Life challenges are done “for us” not “to us.” Life challenges such as poor health, the death of loved ones, divorce, relationship breakdowns, financial hardships or career disappointments are difficult to accept. But what if we changed the way we looked at these challenges? What if we decide to accept that they are done “for us” and not “to us”. For example, your spouse has an affair and ruins your life. Viewing our circumstances the way the world does will leave us feeling hurt, abused and unforgiving. But if we choose to look at it from this new perspective, we may eventually be able to detach ourselves from the situation and move on with our lives. If we change our perception of these difficulties we can look for the lesson in each one. We can all choose to lose the victim mentality and instead become empowered to make necessary life changes and allow life to proceed with a new attitude – one of searching, listening and knowing that we may need these lessons for spiritual growth. With this new perspective, we can be wiser, more humble and become women with immense gratitude and personal power! Lesson #3 and #4 to come in March! As a Spiritual Arts Practitioner and Interfaith Lay Minister I define hope and offer this to others by sharing my faith in the perpetuation of the soul along with the Divine’s constant communication of caring and guidance, which I have known to be both practical and immediate and of far reaching value. It would be hard for most of us to have hope without the certainty that we go on after the ‘change called death.’ I share this knowledge with those who have asked for healing through evidential verification, with their openness and permission. I then use my mediumistic opening or channelling to bring this to the fore and share with them the writings and practical help of others which tell of the science and philosophy of my faith, and indeed, the comforts beloved spirits would bring to their situations through spirit communication. I believe that the reality of the presence of the Divine is also evidenced by the presence of each other and the holding of the Divine in our hearts. I seek to walk with others to bring healing help in a way which would be strong evidence of this. We ourselves are evidence of God’s love when we share it with others and evidence the Divine in our lives. It is important to share our stories of guidance and constructive path making and growing to shine the beacon which we all need to light our paths to Spirit. I seek to bring about these stated purposes as an Interfaith Lay Minister through service planning which would include music, meditation, texts, talks and fellowship time with other seekers, being sure to include validation of the comforts others may have found in their foundational religious practices, as I believe the Divine is active in all seeking traditions. My desire is to bring all in fellowship together by seeking to present many opportunities for the sharing of mutual and individual paths. Through the sharing of faith in the Divine, we all find reason for hope.